Famous Renaissance artist Leonardo da Vinci said, “Simplicity is the ultimate sophistication.” This statement applies as much to paintings and sculpture as it does to furniture. And this leads us to a bedroom set from Weaver Furniture Sales that epitomizes simplicity and sophistication. It’s the Marshfield Shaker Bedroom Collection: Simply Elegant. The Shakers were an 18th Century Christian sect which settled along the Eastern seaboard. The early Shakers began making furniture to accommodate large worship gatherings. But Shaker craftsmen built furniture to reflect their devotion to simplicity and practicality. Plus integrity and a strong work ethic. As a result, they built furniture devoid of ‘prideful’ elements like inlays, carvings, metal pulls or veneers. The Marshfield Shaker Bedroom Collection reflects this trend. With its tapered legs, arched base, flush panel drawers and simple wood hardware, the Marshfield Shaker Bedroom Collection displays a classic-style of elegance and sophistication. And many astute furniture lovers find these features irresistible. Amish cabinetmakers build each drawer with dovetail joints for added strength and durability. Also, the drawers open full extension. So owners can enjoy easy access to every corner of each drawer. Something that’s impossible with drawers that only open partway. What’s more, the optional under-mount drawer slide enables owners to close the drawers with a gentle push. And customers can order the bedroom set in their choice of wood species. Choices include oak, maple, cherry and hickory. 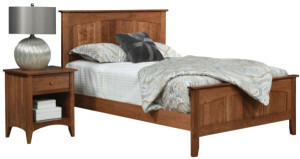 The Marshfield Shaker Bed features three reversed panels in both the headboard and footboard. They each create a gentle arch. Furniture lovers can select the bed in king, queen, full or twin-bed sizes. Also, the builders can configure the bed with drawers in the footboard or side rails. With its flush drawer fronts, arch base, tapered legs and large mirror, the Marshfield Shaker Dresser emits a stately vibe. Also, the builders install full extension drawers with dovetail joints in the dresser, chest and nightstand. In addition, customers can select from a variety of drawer configurations. So they are able to fulfill their needs and desires regarding design and storage. What’s more, customers can select under-mount soft-close drawer slides. So closing the drawer is as simple as giving it a gentle push. You can explore the Marshfield Shaker Bedroom Collection by visiting Weaver Furniture Sales’ online store. Or, check out Weaver Furniture in person by visiting their ‘brick and mortar’ store in Shipshewana, Indiana. And explore their solid hardwood bedroom furniture sets for yourself.